I wrapped my intake tubes about a month ago. I finally got a change to log the temps in the tubes. Results are very positive, temp difference between the inside surface of the heat shielded and non heat shielded tubes was 13F. The test conditions were as follows - drove the car for about 15min in 93F ambient temp to get engine bay and engine up to operating temp, inserted temp probe from both ends of the tube, results very the same. IMO worth $20. Even if this lower IAT's by a couple of F it is worth it. Was the engine running with air passing through the tubes? good info! are you planning on heat wrapping the air boxes as well? yeah i plan to wrap them also, but need to find a good insulator first. Where did you purchase the wrap? You really need to do that test with hood closed while driving to get a much better sense if the heat reduction. Awesome test Shardul ... thanks for sharing that! I'm still waiting for a data logger to do the full test of AIT's with the box wrapped. I notice too, you did not wrap as thickly as I did on the tubes (20' per tube, 1/4 -1'' overlap) With keeping heat out, the thicker the wrap the better. Definitely some worthwhile results though. im glad it works cause I just wrapped mine like a week ago. use the DEI one, at least we know it works. yup my exact thought !!!! as shown in this thread exhaust wrap works but the things designed reflect heat may work better. i am going to order two of the DEI intake sleeves today if i have some free time. on that note heat wrapping the headers would not be a bad idea since that will help keep under the hood temps down as well. Last edited by prodigymb; 08-10-2009 at 11:31 AM. True that something reflective would work even better. But for my purposes, and for looks it didn't make sense to go that route. I think it would end up looking cheesy for not much more gain. So I went with a much more dense wrap than most are doing. In this application it's being used as insulation, to keep heat out and the cool in the tubes in. The wrap is designed to resist heat from what ever direction so it's not going to hold heat in per se with the constant source of cool air coming through the tubes. What it will do from what my experience thus far is showing, is keep the AIT's cool longer. The next trick is getting the heat out of the engine compartment. Why haven't vented hoods ever been implemented on an E55? In the DSM world, it was common practice to raise the rear of the hood an inch or two with washers or whatnot on the hood bolts, causing hot air to duct out of the rear of the hood. Seems like a rear hood vent would be simple to implement. There's actually a very easy path for some venting. I'm waiting on a data logger before going any farther though. my wife wild, but she loves every minute of it. The rear of the hood - edge of the windshield is actually a positive pressure area. This is why you'll see the cowl-induction hoods on hotrods, such as the one below. I like this thread to cut down on heat in the snorkle to the airbox. I felt that the cars do not have enough air flow consistant enough to keep the powerband steady. I am doing some experiments with my car and the massive amount of heat build up under the hood. I will also keep you guys updated and use your ideas as well and test them to see improvements. I would like to come up with a redisigned snorkle but not sure what the "edge" is that will overdo the engine with to much air intake. Many variables to consider. I have done some data loging on the Left tube only so far, next I will do after the filter, in the airbox right before the MAS and messaure there. Next I will do a velosity test based on the same speeds and almost same conditions as close as possable. See attached pic for some info. 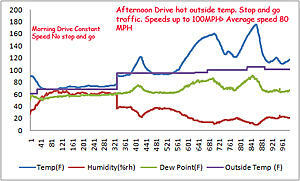 The morning drive was done at 3am for about 1 hour with constant speeds up to 80MPH. 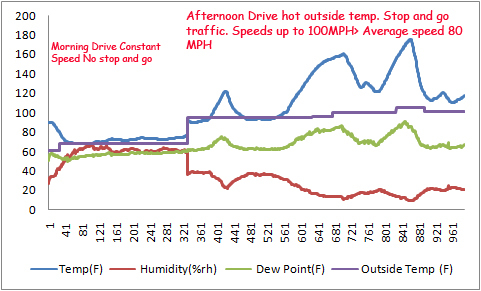 Second drive was afternoon with stop and go and some speeds up to 100MPH. If you guys like I will post more data as I get it through the coming weeks and then do some mods to refect the heat and get the air intake temp more constant across the board. I do not have the massive E55 engine but do have the C63 engine. Will post more info include velosity checks and more logger checks around the engine bay to see what I come up with and using your suggestions on heat reflection see how that can benifit us all. Again thanks for the sugestions.